just because we are living with my in-laws doesn't mean we can't have an awesome room. i am so excited to re-do our bedroom. we will be keeping a lot of our old stuff, but will be refreshing with some new things too. currently the room is brown, we have brown bedding, and not great lighting. it is rather dark. we are starting this week by painting the room a very light grey, to make it more fresh and airy. 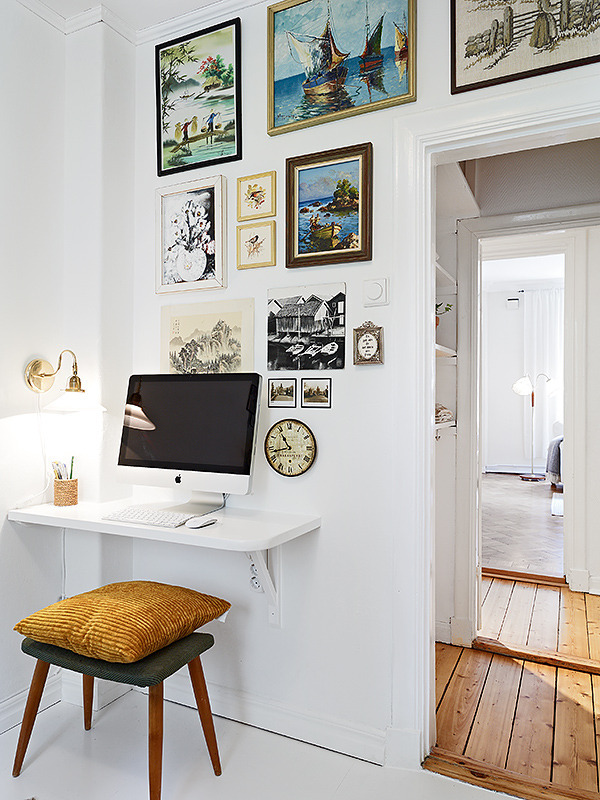 as much as i love the aesthetic of all white rooms, i can't bring myself to do it. i don't know why, i think it would feel unfinished to me. light grey will be perfect. i have already purchased my new duvet cover - it is a nate berkus one from target. it has a navy blue geometric pattern (i will share a picture of it in my next post). i also have new emerald sheets on my bed. along with those two colors, i have a chartreuse dresser and some patterned curtains. overall the room will be greens and blues and grays, with pops of pink and bright art. the pictures below may seem a little disjointed and unrelated, but i will explain it all. 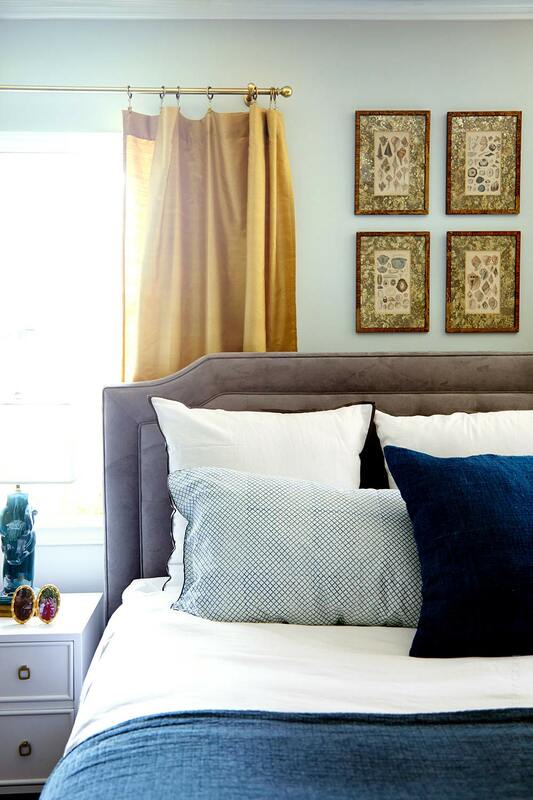 so these first few pictures show bed inspiration/color scheme. i have the navy and white duvet, with green sheets. i want to get a white blanket (or something simple, somehow actually buying all white things is hard. i'm a color/pattern lover, what can i say?). i already have a pink pillow, but i want a few more. 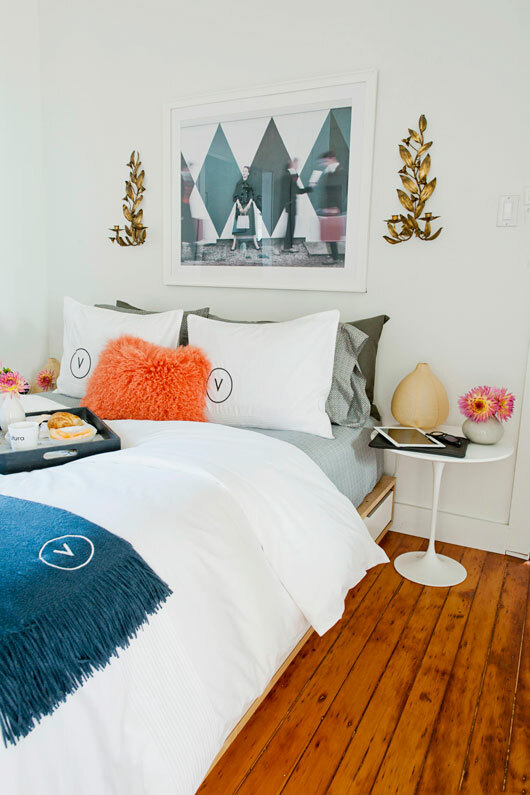 i love the large white pillows, i need to find some pillow cases like that. my mom decorated my room for christmas with gold dot decals, i am obsessed with them. we will be replacing them once we have the room painted. i'm thinking we may do the dots above the dresser/where the tv is, but we shall see. our bedroom also serves as our mini office. we have a small desk that needs organizing, but also to be mostly clear of 'things'. i think some sort of cart/drawers will go underneath. of course we will have an art wall- i have lots of prints i have collected and am working on framing/curating them. i will be sharing a 'shopping list' next of all of the things we need to buy for the room, and where i plan to get them. i can't wait to get this thing done!